If someone brings up Baja, what is the first thing that jumps into your mind? Ok, ok… so you thought of delicious baja chicken, or perhaps baja shrimp. That is fair. If I weren’t writing this blog post I would probably have gone to the exact same place. However, I am writing this blog post, so the route I was aiming for was mental images of adventure, and rugged terrain, and MOTORCYCLES FLYING THROUGH IT ALL!!!! The TCX Baja Gore-Tex Boots are designed to be along for the ride when those mental images become a reality. Wearable both on and off of the motorcycle, the Baja GTX Boots bring together a full-grain leather outer shell with the world-renowned waterproofing capabilities of the Gore-Tex brand for an almost-all-weather (and pretty much all-terrain) piece of moto-footwear. In crafting these boots TCX paid attention to the details (as they always do!) and it can be seen in everything from the suede front and rear padding for added comfort, to the intricate yet durable aluminium buckles. 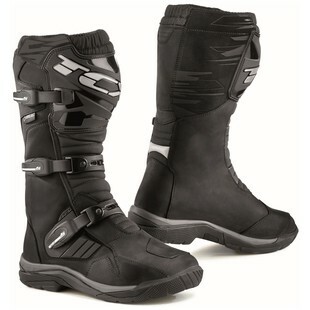 Additional features of the Baja Gore-Tex Boots include ergonomic shin plates, leather shifter pads, and a replaceable footbed for riders who wear such things out. Regardless of where you ride, finding reliable footwear is essential. The TCX Baja Chicken… I mean, Baja Shrimp… UGHH!!!.... I mean Baja Gore-Tex Boots are precisely that.